A hot spring is a spring that is produced by the emergence of geothermal heated groundwater from the Earth’s crust. There are geothermal hot springs in many locations all over the crust of the earth. Hot springs range in flow rate from the tiniest “seeps” to veritable rivers of hot water. Sometimes there is enough pressure that the water shoots upward in a geyser, or fountain. Baldi Hot Springs Hotel and Spa is located in the heart of Costa Rica, at the base of the Arenal Volcano in La Fortuna, San Carlos. This is the perfect family get away that offers 25 thermo mineral hot water pools flowing naturally from the base of the volcano. These medicinal waters are certified by NAL (National Water Laboratory) from the Government of Costa Rica. You will enjoy pools ranging in temperatures from 93, 100, 102, 104, 109, 110, 113, 116, 152 º F, a combination that is suitable to all of our guests. 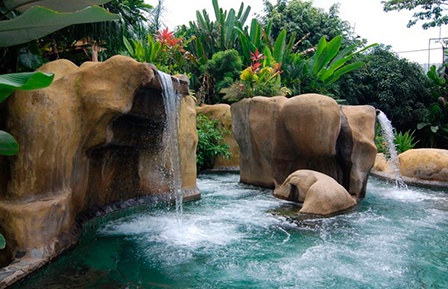 Baldi Hot Springs is the most expansive hot spring facility in the Arenal Volcano area. There are walking paths winding between pools that are large and small, hot and cold. Oftentimes, a cold pool lies adjacent to a warm pool, allowing visitors to cool down or heat up as they please. Indeed, your core temperature will rise after nearly twenty minutes in the hot springs, so it’s advised to spend some time in the colder pools throughout one’s visit. Although the Baldi Hot Springs are safely outside the risk zone of the Arenal Volcano (as established by the National Prevention of Risks and Emergency Commission in a 2001 law), they offer spectacular views of the volcano itself. A visit to the Baldi Hot Springs will provide guests with an experience that is at once relaxing and energizing, soothing and stimulating. Is a great option for families with kids. It does have a bit of a party atmosphere and the pools are all man made, but my kids loved this place! There are three crazy water slides (best for older kids and teenagers) that land in a hot pool. There are lots of man made hot springs of various temperatures, some with music, some with swim up bars, and at the top there are some quiet peaceful springs with mosaic beds. You can book the hot springs with a meal at the buffet restaurant as well. -Do I need reservation ?